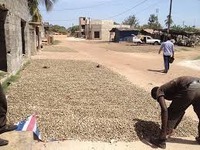 200 acres of grown cashew for leasing. Interested buyers should contact for more information. Thanks Ismail for the info. I think it is advisable that processors in Nigeria sell directly to buyers oversea instead of passing through Vietnam and India. We need to expose them to such market. Kindly lets know the location and estimate cost. We would like to supply you Cashew nuts. we hope you will get back to us as soon as possible.In other to achieve standards in terms of quality and packaging,we observe the following parameters. we ensure that the product is properly dried to avoid moldiness and free from extraneous matters so as not to contaminate the product. We shall package according to your demand,our price and payment terms will be communicated to you as soon as we get your reply. We shall be glad to be of service to you. We are growing company in America USA we are try to find tons of peanuts and cashew nuts ,if you can help me to find the farmers or the export companies who can help me I will appreciate to much. For advance thank you . 1. Quality of nuts (number of nuts per kg, moisture content, float rate, etc). 2. Quantity able to supply at two week intervals. Please bear in mind that tests will be carried out on the nuts supplied to ascertain the quality prior to admittance to the warehouse.